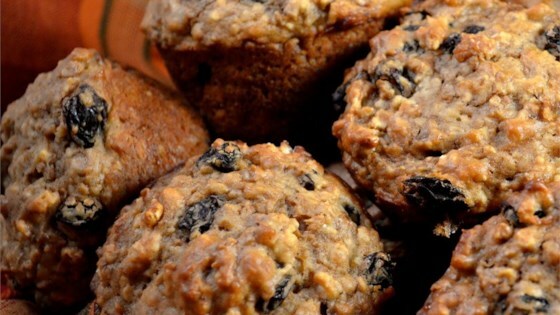 "Why can't oatmeal muffins taste more like oatmeal cookies? These do! The trick is to first caramelize the oatmeal. Enjoy the nice, deep oatmeal flavor." Heat butter in a skillet over medium heat. Cook 2/3 cup oats, 1/3 cup brown sugar, cinnamon and allspice until golden brown. Stir in 2/3 cup water and remaining 1/3 cup brown sugar. Cook until slightly thickened. Remove from heat and allow to cool. In a large bowl, combine flour, 1/3 cup uncooked oats, baking powder and wheat germ. Whisk together egg and evaporated milk. Make a well in the center of flour mixture, and pour in egg mixture and cooked oatmeal. Mix just until combined. Dredge raisins in 1 tablespoon flour, then fold into batter. Spoon into muffin cups. with two 2/3 cup more flour, they become fluffy and more muffiney. the basic recipe is good, but comes out looking like flan, very jelly like. Good flavor, slightly chewy, loaded with raisins. I doubled the amount of wheat germ and used skim milk in place of evaporated. Family loved them! Will definitely make again.